Get the perfect balance of sparkle, shine and simplicity with this gorgeous heart pendant. 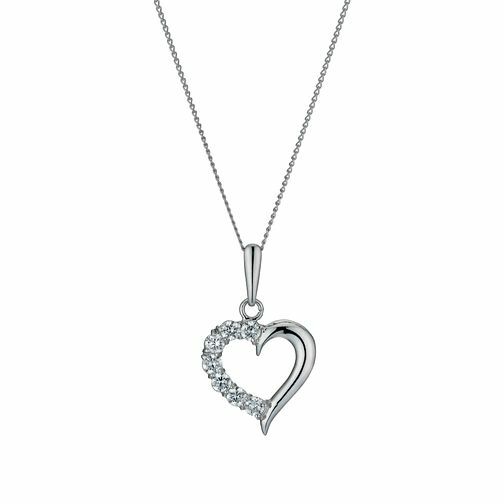 Hung on a fine 18" chain, a smooth 9ct white gold open heart pendant is embellished with a side of glittering cubic zirconia. An individual twist on the classic heart, this is a chic necklace perfect for all occasions. 9ct White Gold 18" Crossover Cubic Zirconia Heart Pendant is rated 3.3 out of 5 by 3. Rated 5 out of 5 by Anonymous from Simple but brilliant The design of it is very simple but it looks really good and was well worth it.